The Renewal Trust’s Creative Programme has found a new home at ‘Place’ in Sneinton Market. 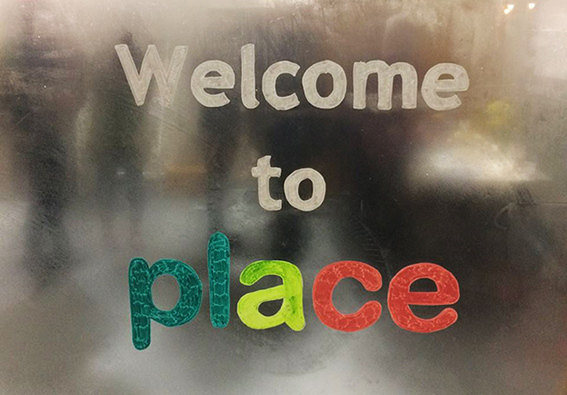 ‘Place’ is based at 25 Avenue C in Sneinton Market and as well as being a hub for our Creative Programme, it’s also a one-stop shop for local people to find out more about art and culture activities across the city. Bridging the gap between communities and traditional cultural venues like galleries and museums. Through Place, our Creative Programme for the next two years is all about giving local people the chance to get involved and have a say in art and culture where they live. We’ve also got an exciting programme lined up, including a new neon artwork for Sneinton Market shaped by local people and events and activities for Nottingham’s first Puppet Festival. Local communities will be the driving force behind Place projects, with a community steering group developing briefs to commission artists, and getting involved in the organising of events and activities. There will also be opportunities to participate in projects through volunteering for example. Local people will shape up to three artist commissions, making sure that projects are bespoke and relevant to the neighbourhoods and communities we work with in St Ann’s, Mapperley North, Bakersfield and Sneinton. In addition, the programme will help to support local artists and up-and-coming talent, together with students and volunteers keen to gain experience of managing and producing arts projects and events. To make sure the programme is of the very highest quality, an advisory panel made up of leading arts organisations, including Nottingham Contemporary, New Art Exchange, City Arts, Dance4, Surface Gallery and Backlit Gallery will work alongside us and the community steering group. Place is being funded through an £80,000 grant from the National Lottery through Arts Council England. Message us if you’d like to volunteer at Place and be a part of the many exciting things happening in your neighbourhood. You can also join our Community Panel and have a say in shaping our next big projects. You can also follow Place on Facebook and Instagram to keep up to date with all our latest news, events and opportunities. We are seeking applications from artists who work in a socially responsive way, who are interested in exploring notions of women’s beauty, across the diverse communities of Sneinton. The project, or residency can take place over one to three months, to be completed by end of November 2018. The deadline for applications is Sunday 1 July 2018.